A10 Talk Top 25 Player Countdown: #22 Eric Williams Jr. Welcome to A10 Talk’s Top 25 Player Countdown. Each day, we publish a new article counting down the 25 best players in the Atlantic 10 this past season, as voted by our staff. Today, we feature #22 Eric Williams Jr. of Duquesne. In his first year at the helm of the Dukes, Keith Dambrot exceeded expectations tremendously, and there are numerous bright spots as Duquesne moves forward. The most exciting of these would have to be Eric Williams Jr., who not only led his team in rebounds, but was second in scoring as well. Keep in mind, he was only a freshman. While at points he played inconsistently, he showed tons of promise throughout the season, and that earned him a spot at number 22 in our countdown. For Williams, his best two games were back to back, and they were certainly memorable. The first came against George Mason, where he carried the Dukes with 34 points in a double overtime win. Not to forget, he also picked up 11 boards, and hit 9 threes in the game. He had a few 20 point games before this, but this was really his coming out party, easily setting a new career-high. Of course, most freshmen who have a big game like that might let up the next time, but not Williams. Four days later, he would pick up where he left off with a 25 point game, also gathering 8 rebounds in the process. These two games showed us what could soon become common for Williams, and if so, the A-10 is going to have its hands full stopping him for the next 3 seasons. 11. That’s the number of double-doubles that he picked up this year, all being a combination of points and rebounds. Considering he was only in his first year and played well against some stiff competition in conference play, this statistic becomes even more positive for Williams. Something else to note: Williams averaged 8.8 rebounds a game, the next highest average on his team was only 4.2. 5-1. This was Duquesne’s record this past season when Williams scored 20 or more points. It was clear that when Williams was clicking, the Dukes were on a different level. The only loss out of those was in overtime as well, in a game that could have went either way. Expect many, many more 20+ point games in his future. 15. 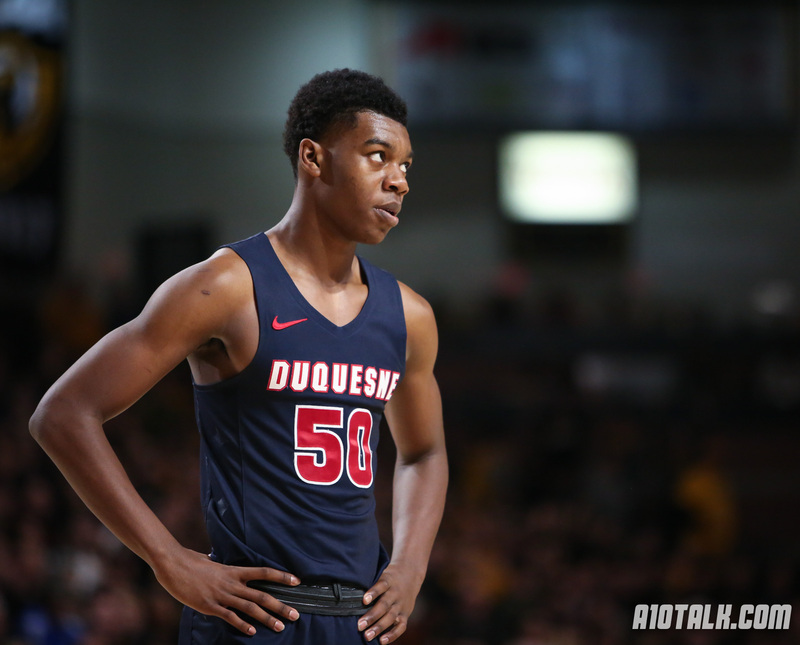 Williams played over 35 minutes in 15 games this year for Duquesne. That experience is crucial, and he will be able to learn from that and continue to improve as he becomes one of the bigger names in A-10 basketball. This is a very young Duquesne team that will look up to Williams Jr. as he keeps progressing. The Dukes are far ahead of schedule with coach Dambrot, and Eric Williams Jr. will be at the head of this Duquesne team for the next three years. With Verhoeven, Lewis II and the many newcomers who will be arriving soon, the Dukes are in the making to be on an upward surge as we head into 2018-19.